It is very good that the computer is protected by Windows, this message appears if Windows does not know the software or not certified publisher! ► Warnings Viruses and Trojans, it always comes, why? 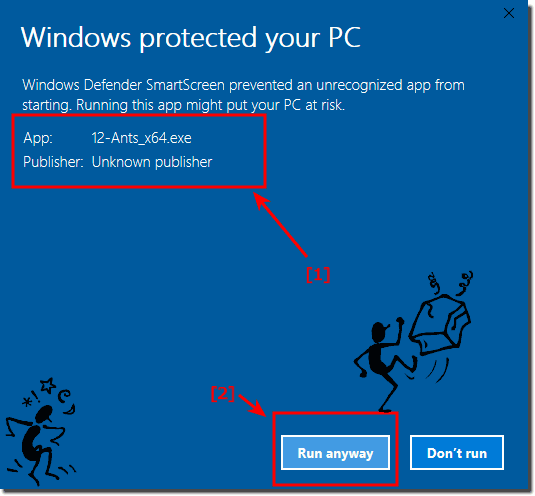 ► Excluding a folder from the Windows 10 Defender, but how? But beware! Certified does not mean at the same time safe, or moral, or ethical. Because your computer could be garbed with Addware, or other Trecking Tools. Addware programs are not viruses, but annoying! (Image-1) Windows Protect Vou Personal Computer! (Image-2) Windows Run Protect Software on the PC! SoftwareOK - FAQ-9: Windows protected your PC! ?